More and more Mumbaikars are realizing that BRT can contribute to reducing the city's massive congestion. Photo: squarejer. After years of delays, Bus Rapid Transit (BRT) is gaining momentum in Mumbai. 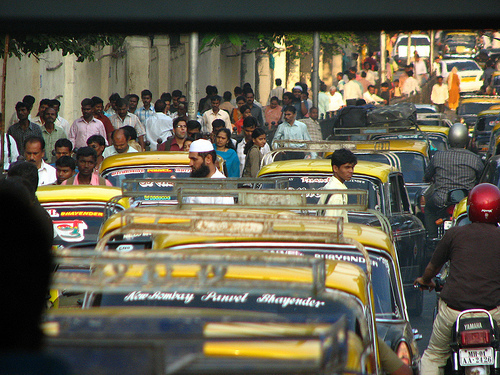 The Mumbai Environmental Social Network (MESN), an NGO focusing on traffic management, is demanding that political leaders implement BRT. With the support of other citizens’ groups and transport planners, the MESN is pressuring municipal commissioner Swadhin Kshatriya, mayor Shraddha Jadhav and BEST committee chairman Dilip Patel to move forward with the long-stalled project. MESN suggests that the city’s first BRT corridor be constructed on the newly-built Jogeshwari Vikhroli Link Road. The 10-kilometer road connects the Eastern and Western Express Highways. Ashok Datar, an MESN trustee, said that introducing dedicated bus lanes would be easy on the JVLR. The Mumbai BRT was conceptualized eight years ago. The Mumbai Metropolitan Regional Development Authority has completed preliminary analysis for 50 kilometers of BRT on two expressways but has handed the project over to the Brihanmumbai Municipal Corporation and BEST, the city’s bus operator. The next steps are unclear, as the BMC and BEST may not have the technical expertise, the manpower or the funding to undertake implementation. Critics have also pointed to the lack of political will that has paralyzed the project. Perhaps this citizen mobilization will prompt Mumbai’s decision makers to act. So far, BEST committee chairman Dilip Patel is in support of BRT.